This was an interesting one: one of those “slow burn” sort of books. I came across it at my local used bookstore (Bookman’s in Tucson – Woo! Bookman’s!) in the discount rack, marked down to $1. I had just a day or two before read an article by Mr. Gopnik (Who is a 30-year veteran at the New Yorker) online, and so I recognized the name; even though I have been trying not to buy new books until I clear off my To Be Read shelf –or, rather, shelves – I couldn’t resist the subject matter. So I bought it, and even though I haven’t been able to find time or energy very well of late, what with school-before-Spring-Break, I decided to give it a read. Odd phrase, that. Am I being generous with my time, granting Mr. Gopnik, and Mr. Darwin and Mr. Lincoln, a few of my hours, growing ever more precious as I age? I am acting as an audience, without which they would be forgotten (Well, at least a little bit. But then, the whole point of the Darwin half of this book is that those little bits, little bits of time and little bits of life, are all there are.). But then again, they are giving me something even better: they are inspiring me. Mr. Lincoln, who comes off a little bit worse than his iconic status (and rightfully so) nonetheless inspires me to believe in the power of a single man to change things; particularly in the last summative chapter, this book points out how incredibly influential Lincoln was with this analogy: imagine if Boris Yeltsin had been able to maintain the Russian empire, and also install a functioning democracy obeying the rule of law. That is Lincoln’s accomplishment, and though the Civil War likely would have happened without him, and the subsequent events of Reconstruction, Jim Crow, and eventual ongoing equality, the country wouldn’t have been the same. He also inspires me because he was a freethinker, an atheist, an introvert, and a deeply literate man. Mr. Darwin, who comes off a bit better than most depictions and associations of him (and rightfully so) inspires me with his ability to be focused on both the infinite and the infinitesimal. Gopnik shows how Darwin had extraordinary powers of concentration and observation, and these, along with a constant need to ask, “Why is this so? How did this get to be this way?” are what led him to his great world-changing theory – which he knew was world-changing, also knew was absolutely correct (as far as science can ever be absolute or correct), and sought, and found, the best way to pour this thought into the collective consciousness of the world. It is remarkable, Gopnik shows, that a theory that in most people’s hands would have been a mere footnote in biology and likely would have taken generations if not centuries to percolate up through the strata until it hit the top – like, as Gopnik says, Gregor Mendel’s work on genetics – was able to completely shift the world’s conversation from a Young Earth creationism to the truth in a single generation. I also love that Mr. Darwin was so deeply in love with his wife that he delayed publication of his work because it would upset her, and also that his own atheism was softened by the same knowledge: that his devout wife would be upset by too-vigorous protestations of what he knew to be true. Though I don’t have to make the same compromise, I appreciate that he did it for her. I am inspired, last but not least, by Mr. Gopnik. This is a complicated book; too complicated, in some ways, because the ideas and the writing are dense, and for me, the subject matter a touch too abstract to hold me down while I work my way through it. It’s written like an essay – unsurprisingly, it started as two essays in the New Yorker, one on each great man (United in this book first by the coincidence of a shared birthday – February 12, 1809 – and second by their impact on the world) – and it’s tough to follow, because Gopnik intentionally didn’t write it as a historical/biographical book. Since I haven’t ever read a good biography of either man, some of this book was lost on me. But I appreciate the enormous effort and scholarship that went into all the thought in this book, and the basic thesis that the two men are equally important to the creation of the modern world, Lincoln in the proof of the ability of liberal democracy and the rule of law to survive, Darwin in the revolution he led that changed essentially everything in the world about how we live with science. I appreciate the effort it shows in the density and complexity and beauty of the language Gopnik uses. 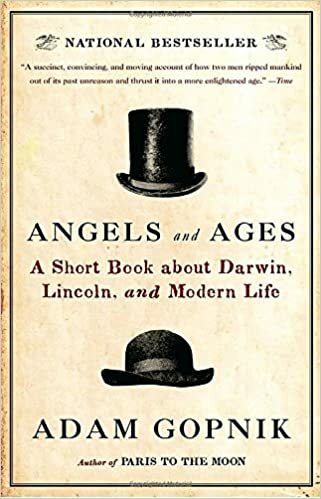 I appreciate that he shows how Darwin and Lincoln are Darwin and Lincoln – and not, say, Alfred Russel Wallace and Stephen Douglas – because of how extraordinarily good both men were as writers. Both masters of rhetoric. Both able to accomplish what they did because of how Lincoln spoke, and how Darwin wrote, and how both of them argued. I like this argument. I like how it’s written. I would like to be able to do the same thing as any or all three of these, at least as a writer. Thank you, gentlemen. I appreciate your time.